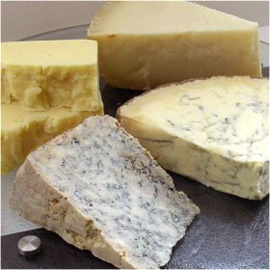 Three large handmade Graviera cheeses from Crete. Photo by Paul Cowan. Stephanie Zonis writes a monthly column on a cheese-related subject. The archived columns are below. 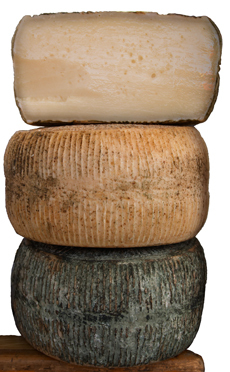 See all of THE NIBBLE’s gourmet cheese articles, reviews and reference materials. There’s nothing more satisfying at the end of dinner than a glass of Port with cheese. These cheeses for Port have been specially selected to complement the rich, fortified wine: Cabrales, Stilton, Agour Ossau-Iraty, and Coombe Farm English Cheddar. You can purchase the assortment from iGourmet, and pick your favorite Port from the cellar. Click on the link for more information.